OK…. I have a little knitting content for you today. But very little, I’m afraid. Because I don’t seem to have the time to concentrate on any larger projects In an attempt to keep 2006 the Year Of The Sock, I have two new socks-aborning on the needles. To the left is the reborn Lorna’s Laces Shepherd Sock in Rainbow. My plans for these toes include a second stab at arch shaping a la Meg Swansen. I think I will work the instep and ankle in the stranded stitch from the Crusoe pattern in Knitty. These socks are being worked on my trusty Inox Gray US#2 circs. To the right is a pair of socks I’m making as a gift. I don’t think the recipient reads here, but just in case I’ll only say that it’s someone who likes red and black a lot. The yarn is Cascade Fixation (I love-a love-a love-a this yarn) in colorways 3628 (cherry red) and 8690 (black). The needles are Clover US#3 circs. Can you tell I’m glad it’s summer and time to start knitting cotton socks again? I think Fixation is so fun in its stretchy goodness, and it comes in such great colors. How much fun can one girl have? I’m thinking of doing the lovemeknot socks in it. But maybe not in red and black. I’m thinking lime green and maybe white. OK. I sorry for the smart-aleck answer, but it is true. The absolute middle of the sock toe will be between the two needles that are used for the cast-on. The tail makes the loops on one needles and the “working yarn” makes the loops on the other. You are probably casting on between 20 and 30 total stitches, and that doesn’t take much yarn. If you want the first toe round to be one color, start the first loop in the middle of the color repeat so that the working yarn and the tail are both the same color. 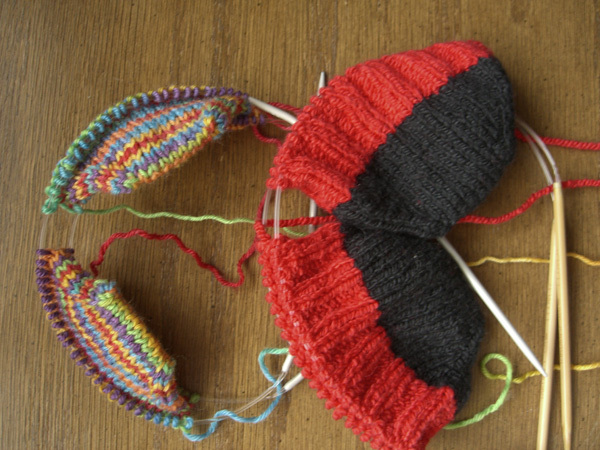 If you want a little stripe of a different color at the toe, start the first loop where the color changes. This is nicely illustrated by the Rainbow socks in the picture above. These toes were cast on with the tail green and the working yarn yellow. If you want both toes to start the same, measure how far it is from the needle to the next color change when starting the first sock, and start the second sock at the same place in the color repeat. If you want your socks to stripe randomly, start in random places. See? It’s not hard at all.